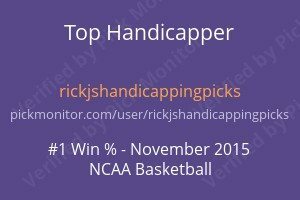 Only 100 College Hoop games to handicap today:) Come join the fun!!! Betting is 55% on the road dog with the line moving from -7.5+106 to -10+106. Models are neutral to slightly favoring Det, Variables slightly favors Detroit and public betting favors Seattle. The move, however, offsets that to a degree. Nothing really stands out, especially when you consider the % numbers are far from extreme. This game is a pass for me. I would have considered taking Detroit but my rules prevent me from taking a side where over 50% of the betting is on that side. Betting is 57% on the Home favorite with the line moving from -3-103 to -3.5-110. It’s -4 at many books. My models point strongly to Oakland. About as strong as it can get without waiving a red flag. Variables also point to Oakland. Public betting is neutral. I was hoping to bet Oakland today but at 43% betting on Oakland my rules prevent me from taking that side. However, if you are thinking about going with the crowd on Houston you might want to give the game another look. Good Luck Today whichever side you take. I will be passing. These are the days as a handicapper if you are not organized you will get a headache very fast. On Friday we had two plays. In College Hoops, we won with W. Michigan +11.5 59-66 and lost with Miami +2.5 100-127. (yes you read the Miami game right). Today I have sent out one play already and have already spent several hours working on the games for today. We are +19.6 Units today for the 2016-2017 Season with an ROI of 21.5%!!! All 4 seasons have distinct handicapping characteristics. While some overlap some are unique to the particular season College Hoops is in. Historically Conference play has been the signal to be cautious. But I did some work during the offseason particularly as a result of the dramatic downswing we had toward the end of last season. The result of my fine tuning has changed several parameters for conference play along with conference tournament play. Although it is next to impossible to wager on sports every day and escape variance there are things you can do to minimize its effect. I put that on the top of my list of things to stay on top of when looking over my techniques. I am falling a bit behind answering questions and will try to get caught up shortly. 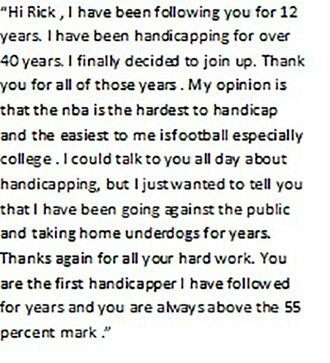 In addition, for those of you considering other handicapping services or for that matter stock investing services, you might want to send me an email as to my opinion of what you are considering. I have studied these areas to the nth degree and you should find my input invaluable.